Some Zombies, Run! 2 clarifications – Zombies, Run! We’re seeing some questions about a few of the features and changes that have come with Zombies, Run! 2, so we’ve come bearing advice which should hopefully clear up any problems you’re having. We’ve heard from some players who are upset about losing their base progress when upgrading the app. Unfortunately, it seems we haven’t made it clear enough that the Season 2 base builder replaces and upgrades the Season 1 base. There are a few reasons that we’ve done this, not least of which being the fact that it fits with what we’re doing with the game’s story. It’s also allowed us to really improve the entire base builder, making it far more fun and involving. This means that Season 1 bases will no longer be accessible or upgradeable from the app once you’ve updated to Zombies, Run! 2. You can revisit your Season 1 base on ZombieLink, by heading to your Base tab and clicking “View Season One Base” in the bottom right hand corner of the screen. All of the original Season 1 story missions are still in Zombies, Run! 2 and have been unlocked so they’re playable at any time on both platforms. On iOS, you can find Season 1 by swiping left or right on the Missions screen.. Check the top of the mission list screen to see which category of missions you are currently exploring. 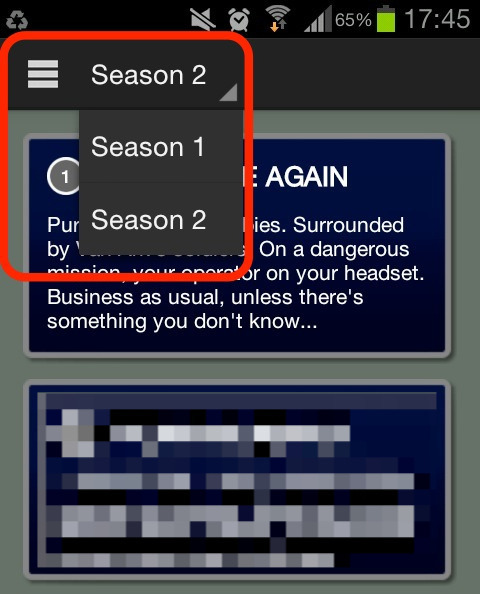 On Android, you can find Season 1 by viewing the Missions screen, tapping on the top left button saying “Season 2” (it has a little triangle in the bottom right corner) and choosing “Season 1” from the drop down menu. On loading Zombies, Run! 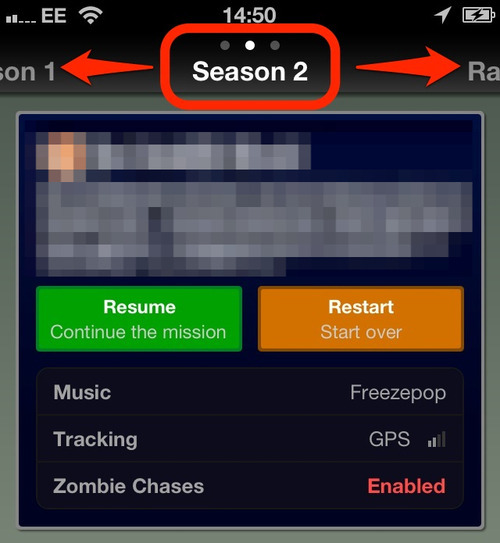 2 on iOS, it may appear that your Season 1 mission progress has been lost. Unfortunately, this is due to a bug in the current version – we’re very sorry about it and it will be fixed in the very next update. However, your run logs still exist, and you can find them in the “Run Logs” section of the “More” screen as well as on ZombieLink. We know that your data is precious and we’ve made sure that none of your run stats have been lost between Zombies, Run! and Zombies, Run! 2 (this applies to iOS and Android). Some of you have noticed that Radio Mode runs and Supply Missions have been removed from Zombies, Run! 2. This was necessary in order to accelerate development, but we plan on adding these back into the game as soon as we can. We will be releasing a hotfix for Android within the next 24 hours that will address a number of bugs and crashing issues – please sit tight. We’re sorry about the crashes – we tested the game on a large number of Android devices before launch, but there are many more out there that would could not test on. Due to the extremely heavy demand caused by everyone upgrading at the same time, our servers were unacceptably slow yesterday. We’ve been improving their performance today and we’ve also provisioned a new server that should speed up loading times. Finally, we have fixed a server bug that caused crashes on some devices. We are working hard on fixing bugs and adding in features (new and old) over the coming weeks. So expect to see regular app updates in the near future as we strive to get Zombies, Run! 2 up to the level of perfection that you deserve. Previous Post Zombies, Run! 2 is out now!